The point of going camping at Lake Tahoe in the summer is to enjoy the outdoors in the sun, go swimming, play, and have fun. 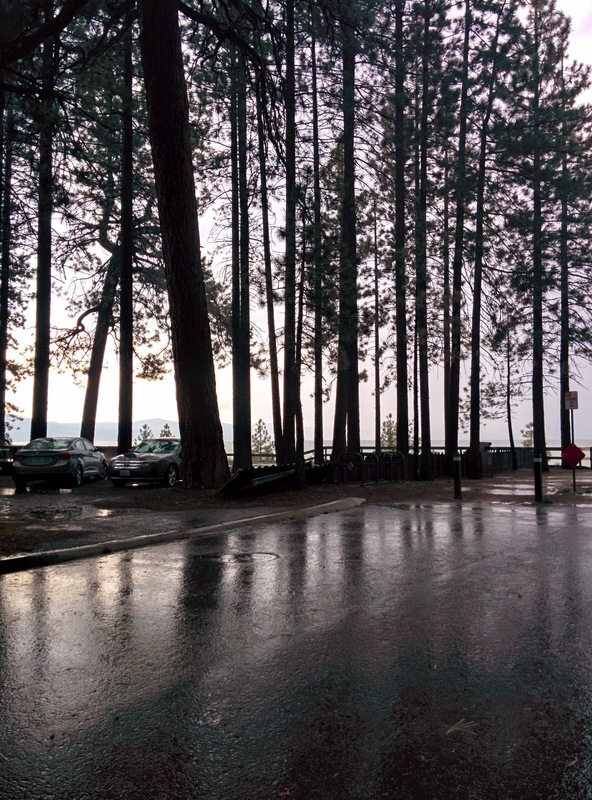 It's not meant to be wet, hurrying up to set up tents in the breaks between rain showers and looking for cover when a thunderstorm comes over the mountains while you're at a lake-side beach. We planned to stay two nights, but ended up cutting the trip short and left yesterday evening just before yet another thunderstorm drenched the area. On the flip-side, California needs the rain, and I (re-)learned about the Tallac site on the south shore which drew travellers from the Bay Area over 100 years ago. They got there from Oakland by train on the SP using the trans-continental line. Transferred in Truckee to the narrow-gauge Lake Tahoe Railway, which took them to the lake at Tahoe City, and finally with the S.S. Tahoe across the lake to Tallac for fun and (illegal) gambling in style.